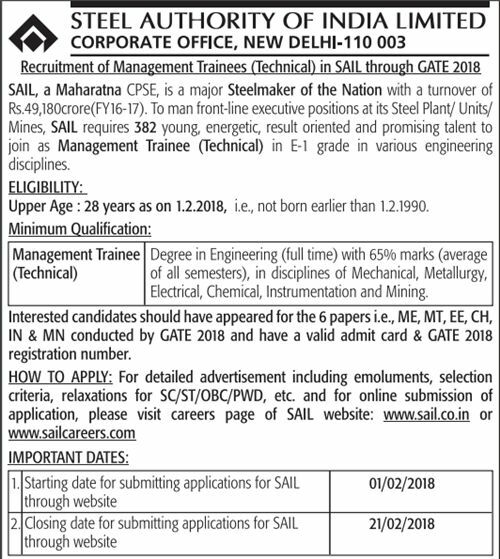 SAIL MT Recruitment 2018: Steel Authority of India Limited (SAIL) has issued the notification for 382 Management Trainee posts. Interested aspirants can proceed to apply before the last date, 21st February 2018. The SAIL MT application form will be accessible on, sailcareers.com from 01.02.2018. Candidates willing to apply for the SAIL Management Trainee Technical posts must have the GATE 2018 qualification. Ie, apart from their regular education, candidates must have qualified in the GATE examination. Aspirants must have the aggregate percentage of 65% or above in their academics. Also, the notification states that the maximum age limit of the aspirants must be less than 28 years as on 01st February 2018. Applicants having the above specified standards can proceed to apply for the SAIL MT Technical posts within the announced period. Scroll down the article for more details. Steel Authority of India (SAIL) is the largest steel making company of Andhra Pradesh state. The organization is headed by Shri P K Singh. With an annual turnover of ₹44,452.41 Crores. SAIL is having a large number of employees working under it in various divisions. The SAIL offers various job openings for the enthusiastic people every year. Likewise, the SAIL has come up with 380 Management Trainee posts this year. Interested aspirants can check the details from here and apply within specified time. Applicants must have the Full time regular Bachelor’s Degree in Engineering or Technology with not less than 65% marks in relevant discipline. Also, aspirants must have qualified in GATE 2018. Maximum age limit of the applicants must be 28 years as on 01.02.2018. Upper age limit relaxations applicable as per norms. Interested aspirants having the suitable educational standards can proceed to apply for SAIL MT Posts through online @ sailcareers.com from 01.02.2018 to 21.02.2018.